This article outlines what an asset management policy is, why it’s important and how to build and implement one. What is an asset management policy? A facility’s assets are the lifeblood of the company, especially in production. As long as they are healthy and working away, every part of the organization can remain strong and productive. But if assets are the lifeblood, people are the heart. Every member of an organization can make an impact on equipment with the decisions they make. Executives invest, engineers design, managers plan, technicians care for and operators use. Because decision-making and asset efficiency are so intertwined, there should be guidelines connecting them. That’s where an asset management policy comes in. To understand what an asset management policy is, why it’s important and how to create one, it’s crucial to first understand what asset management is. An asset refers to anything that is used in the regular operation of an organization. It can refer to physical objects, such as buildings, equipment, or raw materials, as well as intangible things, such as staff or money. Asset management includes not just assets used for maintenance, like machinery and spare parts, but assets used by the entire organization, such as computers, people, and infrastructure. Managing these assets means applying a systematic approach to maintaining their lifecycle in a way that optimizes value. This includes having a strategy in place to develop, operate, maintain, upgrade and dispose of assets in the best possible way. At the end of the day, asset management involves applying deliberate processes to the design, use and maintenance of physical and intangible assets so their value is maximized, from beginning to end. An asset management policy is one of the core requirements of ISO 55001:2014 certification and is a cornerstone of a solid and complete asset management strategy. It is like a compass pointing everyone at your organization in the right direction when making decisions about assets. It does this by providing a set of guiding principles, intentions, goals and methods for asset management so everyone feels confident in their choices and contributions to the facility. For individuals and teams, the policy provides a template for decision-making so people can achieve the best possible outcomes for each task while meeting the organization’s goals. When applied as a core pillar of business, it acts like a mission statement. It not only embeds asset management into the culture of a facility, but also serves as a sign of the organization’s commitment to efficiency and sustainability to those outside the company. They are general and contain broad principles. They identify roles and responsibilities, including policy implementation. They outline how asset management is integrated within the organization. They establish defined goals, service levels, inventory guidelines and standards of maintenance. Building an asset management policy can be a big task, so the payoff has to be worth all the work. Fortunately, there are lots of potential benefits that come from creating these guidelines. Creating an asset management policy eliminates any ambiguity or gaps in asset knowledge. It is concise and sets a strong direction and clear expectations. The document uses language that allows everyone at your organization to see how it relates to them, their role and their goals. It also encourages constant improvement. When these elements are established, complete alignment within a facility can be achieved. Everyone can work together towards the same goals and use the same guidelines for their work. Unity and efficiency are created across the entire organization. When asset decisions are standardized and efficient, it can lead to all sorts of important benefits for every business unit, but especially for the maintenance team. Backlog is reduced, costs go down, inventory is easier to manage and more. An asset management policy highlights best practices that are specific to the organization it is made for. Because of this, it fosters operational excellence and eliminates any room for people to stray from their best work. It ensures that nothing is left to chance when it comes to handling assets. This has a direct impact on the success of the maintenance operation. By setting clear expectations, everyone on the team understands and executes processes and procedure that yield the best results for assets. This is when equipment and people reach their full potential. Maintenance is optimized so assets experience peak reliability and less unplanned maintenance. Tasks are also done with an eye towards being the best in all areas, which means health and safety aren’t sacrificed for speed or cost. Asset management has traditionally been seen as the sole domain of the maintenance team. But because everyone at an organization has an impact on assets, this narrow view has made exceptional asset management difficult to achieve. Having executive sponsorship for the document gives it immense power and makes everyone accountable. This fosters awareness of the importance of asset management throughout the company. Every member of an organization can make an impact on equipment with the decisions they make. Executives invest, reliability engineers design, managers plan and technicians execute. Having an executive on board can also help communicate the organization’s commitment to exceptional asset management to external stakeholders. Customers, shareholders and partners will understand that these best-in-class principles are part of the DNA of the business. This can go a long way to boosting awareness and trust in a brand and its leadership. Executive backing can also provide reinforcement for a maintenance team stretched too thin. A strong policy creates allies within the organization who the maintenance team can rely on to ensure assets are front and centre in decision-making. The following are the most important elements of an effective asset management policy. An example of an asset management policy using these elements can be seen below. This should be the first section of your asset management policy. It sets the tone for the rest of the document by grounding asset management in the overarching goals of the organization. Establish the aim of the organization clearly and succinctly. Use the company’s mission statement or core values as your starting point. Tie asset management to this statement with a brief declaration of its importance in achieving the goals of the organization. This section should be one to three sentences. This section describes the assets, services and business units or roles that the policy applies to. Spend time thinking about all assets, services and people that could be affected by this policy. Talk to members of every business unit to understand what assets they are responsible for and their importance. This section is critically important as it eliminates ambiguity, begins to establish expectations and reinforces accountability. This section should be two to five sentences. This section describes the high-level objectives for asset management at your organization. This further defines the goals you want to achieve with this policy and your complete asset management strategy. It should summarize the rationale behind the policy and more specific objectives as they relate to assets and asset management, such as improved reliability or increased accountability. This section should be three to five sentences. This section outlines any guiding principles, practices and general rules for asset management. It serves as a blueprint for decision-making and provides direction on how to apply the asset management policy to everyday tasks. It should also provide some very general examples of how the principles should be applied, like the delivery of resources and reporting standards. If someone is unsure of how to make a decision regarding asset management, this section should be able to point them in the right direction. This section should be four to six sentences. This is an important part of your asset management policy. It designates who is responsible for all aspects of the policy and asset management in general, including approval, allocation of resources, implementation, defining priorities and any other relevant, high-level actions. This section should be two to four sentences. Part of a great asset management policy is stating the organization’s commitment to continually improving its program and achieving compliance with third-party standards. This helps reduce complacency and keeps the plan as a living, breathing, and actionable strategy, rather than a vague, forgettable document. As facility grows, auditing requirements change and technology develops, processes should change evolve too. That’s why it is extremely to make a promise of continual improvement. It strengthens your facility’s never-ending quest to improve in all areas, which benefits everyone from a safety and financial standpoint. This section should be two to three sentences. Finish the asset management policy by adding clarifying information and further reading. This section includes a list of administrative details and contacts, such as the effective date of the policy, the policy owner and the signature of the executive sponsor. It also includes any related documents, such as a health and safety policy, associated regulations and standards, like ISO 55001, and definitions, terms and abbreviations that readers may not be familiar with. 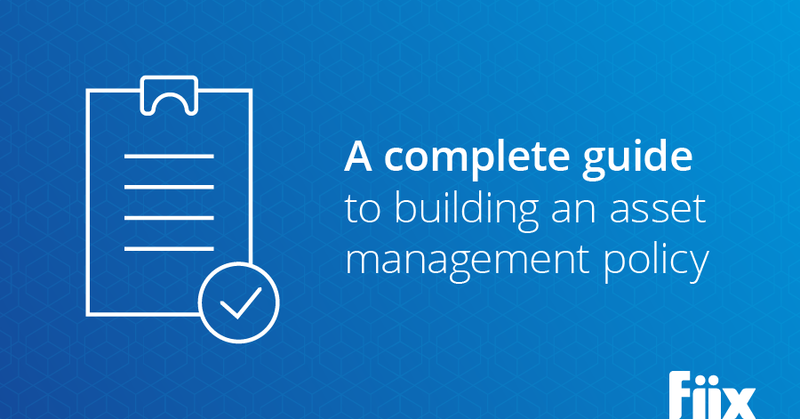 Building an asset management policy is a long process. It’s going to take a few drafts to get it right. It’s critical to collaborate with key stakeholders from all business units when creating, reviewing and refining the guidelines. Identify a sponsor in senior management who can lend support and oversight to the project. Make it short, easily digestible and consistent with other policies your organization has, such as a health and safety policy. Above all else, make sure you take the time to frequently review and update the strategy, even after it has been published. The following is a basic asset management policy template. The template can be adjusted to the specific industry and organization. You can also download the template here. This policy seeks to outline the guidelines and practices that govern decisions on asset management at (Insert Company) to ensure (Insert Company) accomplishes its mission of providing high-quality products in a sustainable and safe environment. This asset management policy applies to all assets owned by (Insert Company) and all aspects of each asset, including design, construction, operation, maintenance and disposal. This policy applies to all employees, contractors and consultants at (Insert Company). In addition, (Insert Company) may rely on natural assets or other assets it does not own. Where operations are supported by these assets, we will work collaboratively with the asset owners and promote the principles outlined in this policy. (Insert Company) provides a wide range of products and services to customers that require ownership and responsible operation and maintenance of physical assets including land, buildings, equipment, transportation, and waste. The intent of this policy is to ensure all employees and functions of (Insert Company) are aligned with the goals of (Insert Company) as they relate to asset management and to ensure assets are managed in a manner that maximizes benefits, reduces risk and provides satisfactory levels of service to customers in a safe and sustainable manner. Taking steps to connect the appropriate departments, functions, and support activities in order to build effective working relationships and encourage information-sharing. Using asset management decision-making to drive optimum value for customers. Ensuring decisions are made collaboratively. Ensure decisions consider all life-cycle stages and interrelationships between asset, operational and service performance. Focusing on decision-making that recognizes the interconnected nature of asset systems and how decisions about one set of assets may potentially interact with or affect assets controlled by other departments and functions. Developing long-term projections of investment needs and applying rigorous analysis, including consideration of risk, to identify short-term needs. Implementing processes to ensure investments address needs efficiently and effectively, and address operational budget implications of capital investments. Exploring efficiency opportunities where appropriate, including new technologies. Analyzing investment plans and associated funding requirements and putting in place mechanisms to ensure long-term financial sustainability. Evaluating relevant asset investment decisions based on consideration of the costs associated with managing an asset through its entire lifecycle. Developing prioritized capital investment plans that reflect community and stakeholder expectations with regard to the level of service and other strategic objectives. Driving innovation in the development of tools, techniques, and solutions. Monitoring and reviewing the effectiveness of asset management processes and the wider asset management system in supporting the delivery of strategic objectives. Assessing competencies necessary to implement proper asset management and providing support, education, and training to fulfil these competencies. Reviewing this policy and making any necessary adjustments on an annual basis. The executive committee is responsible for approving asset management policy, articulating organizational values, defining priorities, approving funding and resources to implement the asset management policy and associated requirements, and approving asset funding through multi-year and long-range financial plans. The chief reliability officer is responsible for leading the implementation of this policy across the organization. Departmental managers are responsible for leading the adoption of this policy within their departments and allocating appropriate resources to its implementation. All staff involved in the application of asset management are responsible for observing the requirements of this policy. Creating the actual asset management policy is just the first step. Now comes the hard part; making the principles and procedures outlined in the document a part of the facility’s DNA. If the principles are quickly forgotten, asset management will continue to be an afterthought and asset performance will fail to reach its full potential. The following are three, key steps that will ensure the asset management policy is implemented properly and with the desired impact. Communication is vital to the success of your asset management policy. You must communicate the policy to all staff, especially intent and next steps. If no one is aware of how they are affected by the policy, there will be no accountability and implementation will be difficult to achieve. Consider creating a shorter, one-page document outlining key elements so all employees can read and understand it easily. It’s also crucial to make the asset management policy accessible. Post it around your workplace and make sure it’s visible. Make it available to view in a variety of formats, like team briefs or a short video. And ensure employees who have suggestions for revising the policy can do so without too much trouble. Every project needs a leader so plans are executed and tasks are completed. An asset management policy is no different. Identify a member of staff who will champion the plan and develop a strategy for implementation. This person may be you or a committee that divides the work and responsibilities. This project owner ensures the implementation plan is being followed, answers any questions from staff and fine-tunes processes.
. . . an asset management policy fosters operational excellence and eliminates any room for people to stray from their best work. It ensures that nothing is left to chance when it comes to handling assets. A commitment to continual improvement is embedded in your asset management policy and it should be kept. The individual or committee tasked with owning the strategy should also spend time looking for ways to improve the policy. This can take the form of an annual review, regular stakeholder meetings or other forums that identify and implement improvements. Communicating and tracking anything is difficult to do without a system to do it with. That’s where software can come in handy. Having a computerized maintenance management system is one digital solution that can help make the implementation of your policy much easier while increasing its impact. Having professional maintenance software allows facilities to capture more information, use powerful tools to analyze these metrics and apply their findings with fewer headaches. There are lots of data capture tools available through software, like checklists, work order histories and in-depth reports. These tools make it easier and more accurate to determine the progression and impact of policy implementation. For example, a checklist can outline the proper steps for repairing an asset and can also include any guidelines or wording from the asset management policy. Using software, this checklist can be digitized, attached to an asset and tracked, so technicians can be frequently reminded of the policy and live it. Finally, software makes it easy to access a digital version of the most up to date document so staff doesn’t have to go hunting through their emails or a file cabinet to find the policy whenever they need to consult it. This also makes communicating updates to the policy much easier so everyone knows what has changed and what those changes mean for them.